The Atacama Large Millimeter/submillimeter Array image shows close-ups of galaxies. The ALMA observations, at submillimetre wavelengths, are shown in orange/red and are overlaid on an infrared view of the region as seen by the IRAC camera on the Spitzer Space Telescope. The Atacama Large Millimeter/submillimeter Array imaged in deep detail 126 galaxies where stars are formed. Previously, these dusty galaxies were difficult to observe because of the available imaging technology. But with the ALMA, each galaxy were imaged in rich detail in minutes. In the constellation Fornax, meaning The Furnace, lies the Chandra Deep Field South. This region is extensively observed and studied by scientists. 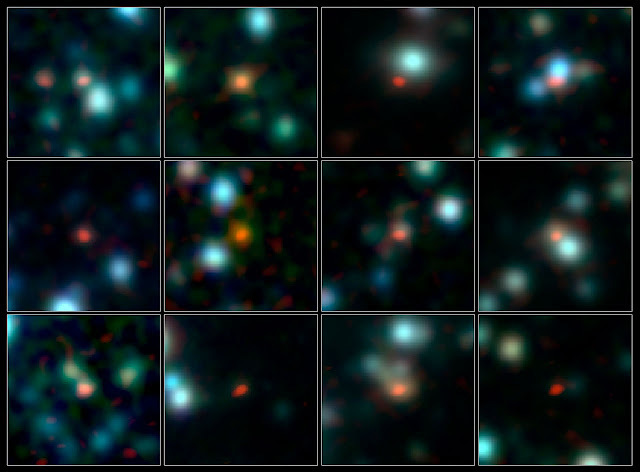 Using the ALMA telescope, 126 galaxies were captured in deep and high resolution images. The best map so far of these distant dusty galaxies was made using the ESO-operated Atacama Pathfinder Experiment telescope (APEX). It surveyed a patch of the sky about the size of the full Moon, and detected 126 such galaxies. But, in the APEX images, each burst of star formation appeared as a relatively fuzzy blob, which may be so broad that it covered more than one galaxy in sharper images made at other wavelengths. Without knowing exactly which of the galaxies are forming the stars, astronomers were hampered in their study of star formation in the early Universe.